The Stop Speeding Pledge is a tool from the Sussex Safer Roads Partnership 'Stop Speeding' campaign. 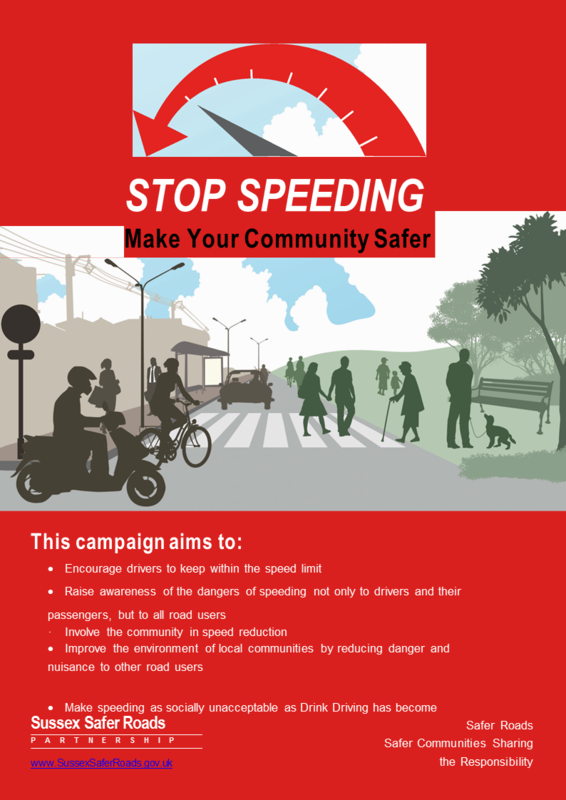 For someone to put their name to the Stop Speeding Pledge basically means that they accept and support the campaign which is designed to encourage, educate and promote safer driving and reduce casualties on the roads of Wealden. As part of the ‘Stop Speeding Pledge’ campaign we will promote Sussex Police’s Operation Crackdown and encourage residents to participate in the their community’s priorities and take some personal responsibility. In short it’s a promise made by the local residents that they will be good road users themselves. The only information we collate specifically for the 'Pledge' is the householder's postcode and the number of 'supporters' within that address. This information (e.g. BN20 6LH = 3 supporters) is then forwarded to the Casualty Reduction Officer who will in turn forward it to the relevant Parish Clerk. Having said this, for our NPT benefit it would be helpful if we knew the name and address of the people being spoken to so that we do not duplicate literature to them. Perhaps this may be a good opportunity to seek a community contact and speak about Operation Crackdown. Although the 'Stop Speeding Pledge Supporter' is supporting the campaign and showing their solidarity to their community, their personal details will not be held on any lists or databases unless they are happy to give their details for our own monitoring purposes and community contacts. The benefit of a person signing up to/supporting the 'Stop Speeding Pledge' is that they are showing their alliance with their community. If they all adhere to the speed limits themselves, utilise Op Crackdown where appropriate, promote the campaign to their neighbours and support Community Speed Watch, this would go some way in addressing the speeding problem in their locality. I hope this makes sense. If not and/or if you find any other anomolies within the strategy please do not hesitate to contact me.